Healthy Hotties: Quinoa 'keen wah', what the heck is that? I personally believe…or hope… that Quinoa is becoming more common in homes these days even compared to just two years ago. This is solely based on the fact that I did not know what it was at that time and now I tell everyone about it. Before I started on my path to become a Holistic Nutritionist I did not know such a thing existed, I was only familiar with common grains such as oats, rice, wheat and whatever came out of a cereal box. But as I discovered quinoa, I discovered it could be more than just a side it can be a whole yummy meal. You can have a 3 way with quinoa, breakfast, lunch and dinner. Oh yes sweet quinoa, or should I say fluffy, creamy, slightly crunchy texture and a somewhat nutty flavor when cooked… quinoa. A little background on this hard to pronounce and spell grain. Most commonly considered a grain, quinoa is actually a relative of leafy green vegetables like spinach and Swiss chard. It is a recently rediscovered ancient "grain" once considered "the gold of the Incas." Quinoa is also a great source of protein, a complete protein I might add, meaning it has all the essential amino acids in it. This is also a good choice for vegans or people that just want a complete meal all in one. It is high in manganese and well-endowed in magnesium, iron, copper and phosphorus. Quinoa is also gluten free, helping it be an easily digested form of complex carbohydrates that will give you long lasting energy. 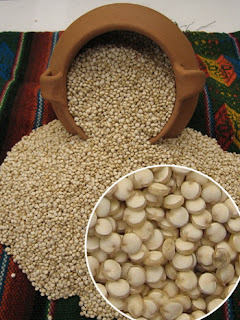 There are different ways to purchase Quinoa with organic being the best compared to a huge open bulk bin. If you do buy it in bulk, buy in small bins with a lid this will help keep the quinoa fresher with a higher turn over rate and sealed from outside germs. You can also buy it in packages by the pound from brands like Bob Red Mills and not only is this sealed but pre-washed, which could be more convenient for some. Also if you see moisture stay away from it but if it’s in a sealed container it can last 3-6 months in the refrigerator. Most times you boil quinoa for about 15 minutes until you notice that the grains have become translucent and it appears to look like a white-spiraled tail. When you boil it, it is 1 part grain to 2 parts liquid. If you would like it to have a nuttier taste then dry roast it for about 5 minutes in a skillet before cooking it. The Red Mill brand is pre-washed unlike most quinoa you will buy in bulk. Meaning there is some soapy saponins that coats quinoa seeds left on the quinoa after it is processed. The best way to remove this is wash the seeds in cold water thoroughly and a few times if they still taste bitter do it again. The work is really worth it! Three ways with Quinoa means it is so versatile; you can have it for breakfast, lunch or as a dinner side. You can have some cooked up in your refrigerator and you can add to it whatever you want as a quick, well-rounded wholesome meal. Try something new, feel light and full all at once.